Signal Peak Energy’s Bull Mountains mine No. 1, located 30 miles north of Billings, Montana, USA, mines bituminous coal from the 10-ft-high Mammoth coal seam. Longwall recovery history was made here in late January by successfully mining into and recovering the longwall in a 42-ft-wide predeveloped full-face recovery entry. This longwall recovery fulfilled the Signal Peak vision to safely advance the longwall into a predeveloped recovery room without the need to stop and install any supplemental roof support. This entry was bolted, meshed, and then completely backfilled with a specially formulated, cuttable, low-density concrete. Previously, the widest predeveloped, successful full-face recovery entry was 36 ft (at Alliance Resource Partners’ Mettiki mine) and that was not backfilled with cuttable concrete. To retrieve the shields at the end of a longwall panel, the Bull Mountains mine No. 1 employed a traditional recovery entry in the 1 Right panel and predeveloped recovery entries in 2 and 3 Right panels. For a new mine with specific geological conditions, it was difficult to accurately predict the behavior of the roof strata when the longwall face approached the recovery entry. 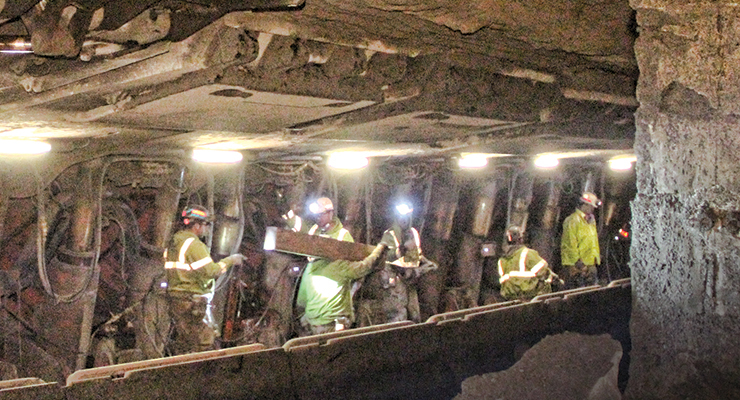 The lessons learned from the 1 and 2 Right recovery entries enabled mine management and Keystone Mining Services (KMS) to work together and design an effective roof support plan for the 3 Right recovery entry. The success of the 3 Right recovery entry created a record for retrieving the shields within 15 days, not to mention the safest working environment for protecting miners. Figure 1: The 1 Right recovery room cave observation. Every mine has its own geological characteristics, and the Bull Mountains mine has two unique geological features that many other longwall mines do not have: low overburden and a distinct pattern of roof joints. The overburden above the Mammoth coal seam in the 1-3 Right recovery areas is approximately 200 ft thick. The roof consists of shale, siltstone/sandstone and rider coal (Rehder coal seam). 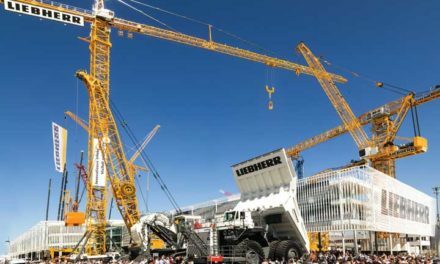 The location of the Rehder seam changes, and when it comes close to the roof line, roof instability may occur if sufficient roof support is not installed. The prevalent roof sandstone jointing is rather unique in that the joint set striking at 60° is present over the entire mine property with a very consistent average joint spacing of approximately 20 ft. The current longwall face orientation is parallel to the joint sets in order to minimize sandstone cantilever overhang distances and the associated frontal abutment stress during longwall retreat. Normally, the roof caves periodically after shields move outby approximately 70 ft. Also, the frontal and side abutment stresses are normally very low. When recovering the longwall face from the first two panels, the mine experienced adverse roof conditions. In 1 Right, a 20-ft-wide conventional recovery was attempted, but ended up being 12 ft wide from the shield tips to the outby coal rib. Additional wood cribs and steel beams were installed, reducing the entry to 9 ft. A roof shear with an angle of 5°-9° from the vertical occurred, and broken roof rock applied significant loading on the shields. The broken rock reached a height of approximately 20 ft above the roof line. The abnormal roof conditions in 1 Right recovery entry can be first attributed to the delays associated with installing roof support in the recovery entry. Within this period of time, a rock cantilever formed above the shields and rotated due to the easily caving gob. Over time, the rotational movement of the cantilever beam induced an angled shear near the outby rib line of the recovery entry. Surface fractures and subsidence appeared very soon (see Figure 1). Figure 2: The view from the face as the longwall cuts into 2 Right recovery room. The predeveloped 2 Right recovery entry was 30 ft wide, and in addition to cable bolts, was supported with three rows of 24- and 36-in. diameter, cuttable, pumpable cribs within the recovery entry and one row of 30-in. diameter, non-cuttable, pumpable cribs on the outby pillar side. Problems installing the recovery mesh over the shields caused significant delays, which allowed the roof to deteriorate, and significant loading occurred due to load transfer from the fender pillar to the pumpable cribs in the recovery entry and shields on the face. The fender pillar refers to the narrow pillar of coal between the longwall face and recovery entry. Approximately 24 in. of roof convergence was measured in the recovery entry after the fender pillar yielded. Prior to this convergence, large pieces of rock fell in front of/above the shield tips (see Figure 2), which significantly slowed down the advancement of the longwall face. Figure 3: 3 Right recovery room layout and mining/backfill sequence. The 3 Right recovery entry was developed in two phases: (1) the inby 21-ft-wide section and (2) outby 21-ft section (see Figure 3). The inby section was completely bolted along with steel wire mesh, then the nonmetallic recovery mesh was installed. This section was then completely backfilled with cuttable, low-density concrete. After the concrete was cured in Phase 1, the outby 21-ft-wide section was developed, bolted, meshed, and also completely backfilled. A 5- and 7-ft-long, 0.804-in. diameter J-Bar, grade 75, fully grouted bolt was installed as primary support along with wire mesh in the recovery entry. As supplemental support, 25- and 16-ft-long, 62-ton capacity, 1.10-in.-diameter sumo cable bolts along with 20-ft-long T3 roof channels were installed. The cable bolts were fully grouted with a thixotropic grout after initial installation with a normal 4-ft resin cartridge. To reinforce the outby rib, a roof/rib angle channel along with two, 5-ft-long J-Bar, grade 75 bolts were installed. In the transition zone between Phase 1 and Phase 2, two cross-installed cables were installed to reinforce the roof beam (Figure 4). The roof Reinforcement Density Index (RDI) was calculated to be 1.62 MPa/m. Figure 4: Primary and supplemental roof supports in 3 Right recovery room. In the chutes, two rows of 25-ft-long, fully grouted, 62-ton-capacity sumo cable bolts were installed along with a 30-ton cable truss system as supplemental support. 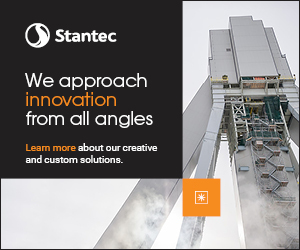 Due to the fact that the floor elevation dipped from the tailgate to headgate side, bulkheads were built and the low-density concrete was pumped from the headgate to tailgate side through surface boreholes. All backfill pumping was conducted by Wright Concrete and Construction Inc. Backfill rates were 800 cu yd or less, and no more than 2-ft fill depth per zone, per 12 hours daily, followed by 12 hours of initial curing. The backfill concrete density was continuously monitored. 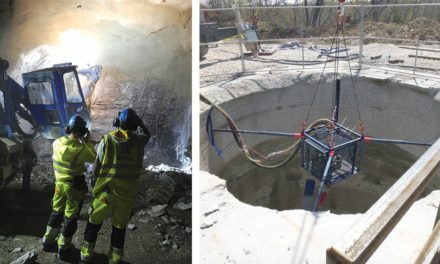 Test samples of the backfill concrete were taken every hour of pumping, 20% of the samples were tested by a certified laboratory after curing at least 28 days, and a minimum unconfined compressive strength (UCS) of 800 psi was maintained. Based on this strength value, the Standing Support Density (SSD) value for the entire recovery entry was determined to be 5.5 MPa. Slightly more than 19,000 yd3 of concrete was pumped for the entire project. Inspections to confirm full contact of the concrete to the roof were conducted using boreholes and cameras along with inspection pipes installed at the top of the forms and bulkheads. Observations were made of the phase 1 backfill contact to the roof during phase 2 mining. If voids were encountered, they were filled with polyurethane (PUR). Mining would not continue until the PUR was cured with a minimum UCS strength of 800 psi. Ventilation was provided across the top of the entire backfill until the final lift was poured and the backfill was completed. A minimum air flow rate of 6,000 ft3 per minute (cfm) was maintained. Figure 5a: Exposed pre-installed bolts, steel roof channel and mesh. When the fender pillar was 6 ft wide, the load transfer occurred at the outby concrete and inby shields, and the shearer easily cut both the coal and concrete. The concrete was in complete contact with the roof, and appeared stronger than coal due to its lack of cleats and fractures. Approximately 6 in. of concrete was left on the roof during cutting, and it easily peeled off afterward, exposing the pre-installed roof support. No roof/rib sloughage or loading was observed in the face. This condition would indicate that the stress was completely controlled by the pre-installed support system (bolts, cables, steel channels, mesh, etc. ), as shown in Figure 5. Fiberglass bolts were installed in the middle of the concrete for rib control and as a horizon indicator for the shearer. No floor heave was observed in the face. The roof strata caved easily behind the shields. Also, the pre-installed nonmetallic recovery mesh laid down perfectly behind the shields. Figure 5b: Close-up of pre-installed 62-ton sumo cable bolts on the roof channel. After the last cut of concrete in the recovery entry, a 1- to 2-ft thick portion of concrete was left on the outby pillar rib. No indication of stress or roof/rib sloughage was observed in the face or chutes after the cut-through. The concrete/coal pillar corners remained sharp with absolutely no signs of pressure (see Figure 6). Shield leg pressure graphs within the last 63 passes indicated two loading events; i.e., an increase of shield leg pressures. The first loading event occurred when the coal fender narrowed down to 6 ft wide, with some shield leg pressures increasing to greater than 6,800 psi. This loading event was due to load transfer from the fender pillar to outby concrete and inby shields. The shield leg pressures returned back to normal when the roof rock caved behind the shields, indicating a pressure release. Figure 6: The view from the face into Chute No. 2 after complete cut-through. Also, when only 4 ft of concrete remained and the shields were in the final position, some shield leg pressures increased higher than 6,800 psi. This indicated that most of the load on the concrete transferred to the outby pillars, and part of load to the face shields. These shield leg pressures returned back to normal again when the roof rock caved behind the shields. Moreover, shield leg pressures indicated that the shields in the middle and tailgate side of the face incurred much higher leg pressures than those at the headgate side. This was due to the fact that the loading condition, because of gob on both sides, was higher than the headgate side (one side gob, other side solid panel). Shield convergence monitoring data indicated that: (1) as the time passed when the shields sat at their final position, the shield convergence typically became larger, with a maximum value of 3.5 in., and (2) the shields in the middle and tailgate side of the face incurred larger convergences than those at the headgate side. The measured surface subsidence contours indicated that 5 ft of surface subsidence was measured 210 ft inby the 3 Right recovery entry. The surface subsidence values decreased toward the recovery entry with 1 ft of surface subsidence directly above the middle of the recovery entry. The authors (left to right), Dr. Xiaoting Li, Dr. John Stankus, Brad Hanson and Robert Ochsner, discuss progress of the recovery room while standing in Chute No. 1. The 3 Right predeveloped recovery entry was designed based on the experience gained during the 1 Right and 2 Right recovery entries and specific geological and mining conditions, especially the low cover and joint-prevalent features. The successful cut-through of 3 Right recovery entry can be mainly attributed to the: (1) completely backfilled low-density concrete, and (2) pre-installed primary and supplemental bolts, along with a T3 roof channel, and steel and nonmetallic recovery meshes, fiberglass bolts in the inby pillar, steel rib bolts in the outby pillar, and angled roof/rib channel. This roof support system controlled the roof joints and associated loading condition, effectively transferred the abutment stress, eliminated the time delay associated with installing recovery mesh and bolts on the face, and provided the miners a very safe environment for recovering the longwall equipment. Based on the analysis of the 1, 2, and 3 Right longwall recoveries, the support design for the 4 Right predeveloped recovery will basically be kept the same. Some possible minor changes include: (1) adjustment of the low-density concrete strength, (2) adding an additional recovery chute, and (3) modifying the type and/or length of some bolts, especially in the transition zone of the Phase 1 and Phase 2 concrete backfill. Brad Hanson is the president and Robert Ochsner is the chief engineer for Signal Peak Energy. Dr. John C. Stankus is president and Dr. Xiaoting Li is a senior ground control engineer for Keystone Mining Services, an engineering affiliate of Jennmar. 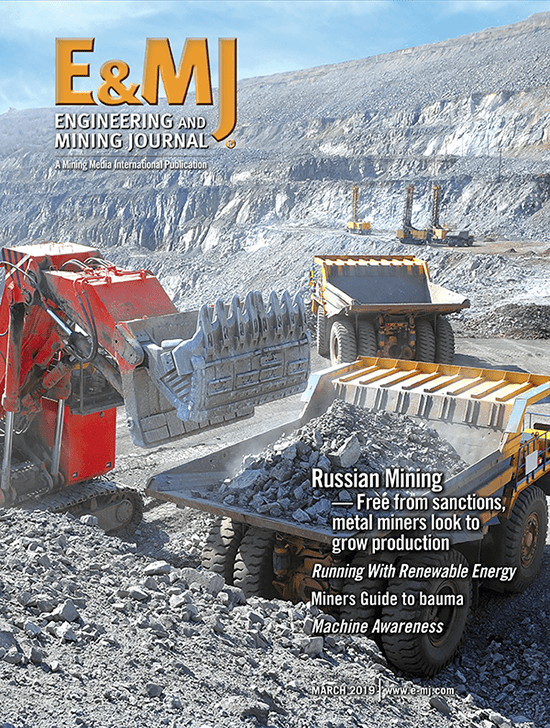 This article appeared previously in the September 2014 edition of Coal Age.